PHOTO BY MARYANN KROMER The Rev. 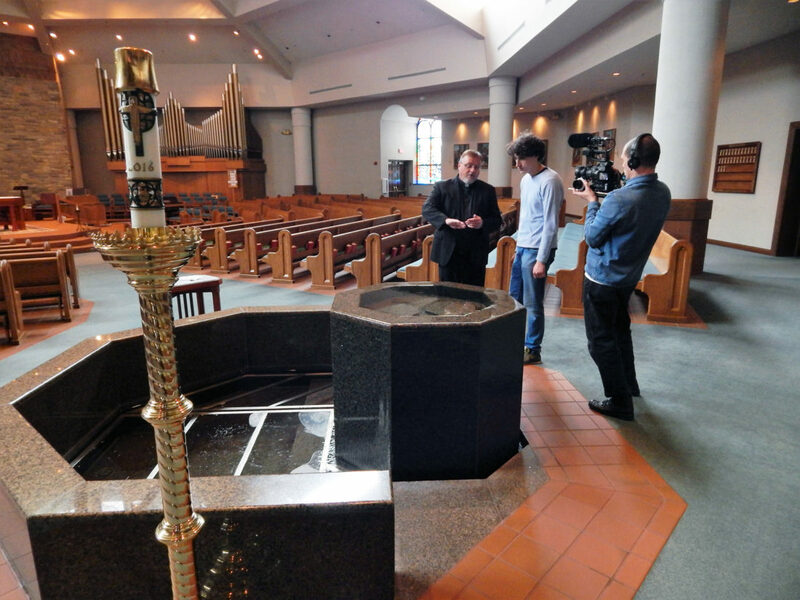 Todd Dominique (left), pastor at St. Wendelin in Fostoria, describes the baptismal font to interviewer Max Kern (center) as Philipp Majer films in the church. FOSTORIA — A film crew from Germany stopped at St. Wendelin Parish in Fostoria this week. The parish of Sankt Wendelin in Germany has commissioned a documentary of its namesake to observe the 1,400th anniversary of St. Wendelin in October 2017. Videographer and director Philipp Majer and interviewer Max Kern said they turned to the internet to research St. Wendelin and places they still might find “traces of St. Wendelin” to include in the film. The video portrays Kern as a contemporary pilgrim searching for ties to the saint in modern cultures. “We came here (to the U.S.) and picked those destinations that seemed interesting for us,” Majer said. Over the past week, they visited Minneapolis; Luxemberg, Wisconsin; Cleveland; Perkinsville, New York; and Butler, Pennsylvania. The men are to continue their mission into eastern Europe and Germany. In November, they were at a church in Sao Wendolino, Brazil. Kern said they were amazed that many people there, especially the elderly, spoke German, although they were not able to read or write in the language. “We could talk to them right away,” Kern said. The many styles of worship also have surprised the filmmakers. Kern said church services in the United States are less solemn than in Germany. Congregations here are more active and friendly, and the pastors tend to be more sociable. “Here, (the pastor) was high-fiving kids. It was a real community, like a family,” Kern said of a recent Mass. The crew said some interviewees had visited Wendel, Germany, and were delighted to talk about it. Such was the case with Peggy Basel, a lifelong member of Fostoria St. Wendelin. She and her husband toured Wendel in 2015. Kern interviewed Mrs. Basel and another longtime parishioner, John Pocs of Fostoria. About 10 years ago, Pocs worked with local historical societies to compile a history of the Fostoria parish. Melissa Kelbley, communications specialist for St. Wendelin, said the parish was founded in 1850, four years before the villages and Risdon and Rome joined to form Fostoria. “I think the most cool thing about it is that Charles Foster, who founded Fostoria, actually donated one of the first pieces of land for the first church,” Kelbley said. Pocs’ history says the parish was organized by settlers who named it for the patron of their home region in Germany. The first church was a frame building at Wood and North streets in Fostoria. A larger brick church was built in 1879 for about $10,000. It housed a relic of St. Wendelin. The twin bell towers were added in 1902. The present church and parish hall complex was constructed across the street from the second church and dedicated in 1993. A stained glass window and the domes from the old church were incorporated into the new stone and brick building. The current pastor, the Rev. Todd Dominique, said he contacted former pastor, the Rev. Daniel Ring, to learn the whereabouts of the relic. Ring reported the relic disappeared during construction and relocation. Dominique emphasized the parish’s commitment to Catholic education. The history says the first school was established in 1873 with an enrollment of 90 students. By 1886, that building had to be replaced with a larger school. In 1909, a third school was built and still stands. The first high school student graduated from St. Wendelin in 1910. Three more graduated in 1911. The parish continued to offer secondary education, but there was no separate high school until 1931. Located on Countyline Street, it was enlarged in 1961. The student body has shrunk in recent decades. The current curriculum emphasizes leadership, preparation for STEM (science, technology, engineering and mathematics) careers and community service, Dominique said. Kelbley said St. Wendelin has about 3,000 parishioners from about 1,600 households. In Germany, the anniversary/feast day is a celebration that runs Oct. 15-30. Fostoria St. Wendelin celebrates St. Wendelin’s Feast Day Oct. 22.